Furious 7 is a massive success. 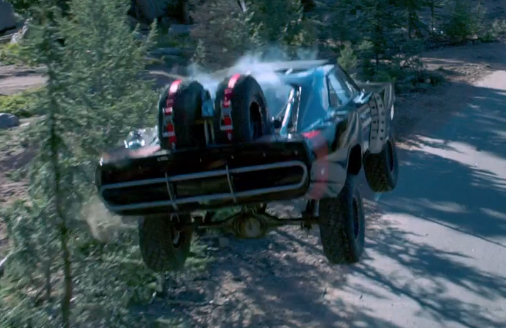 It is one of the few movies out there to celebrate the insane stunts still capable with real cars without the over-reliance on CG. Dodge has always had a healthy relationship with the filmmakers due to how awesome they make their cars look. While many of their new vehicles have been prominently featured through the years, many car lovers look to Dom’s classic muscle cars. One that is featured in the Furious 7 film is his 1970 Dodge Charger. The YouTube channel The AficionAuto had a chance to speak with Dennis McCarthy, the vehicle coordinator for the recent films. He agrees with the idea that CG takes away from the final product, so that means that when the filmmakers can, they are using real cars to perform some of the outrageous action setpieces. His favorite vehicle, it turns out, is the car driven by Vin Diesel’s character Dom, which previously mentioned 1970 Dodge Charger. Consider what the movie does with it and how it looks, I can’t blame him for being so smitten with it. Take a look at the whole video, it is really good watch into the process of making a Fast and Furious film. Find out more about the current models of the Dodge Charger by contacting us at Bayside Chrysler Jeep Dodge. You can also view our new and used inventory online. Like us on Facebook, follow us on Twitter, and visit our YouTube page for more auto news and special offers.